FACT: 'The Way We Were' by Barbra Streisand was the first song I ever sang solo at a concert when I was maybe 15 or 16? I'd had a couple weeks of singing classes, and I had to choose a song that my teacher could accompany me on the piano... everything was 90s pop on her first list of choices... but I just hated singing Mariah or Celine, so I pushed for her vintage collection of songs. A boy from school told me after my song that it was his mother's favourite song ever, and that I'd performed it really well according to her. It was enough to keep going for me, and thus began a small career in extremely non-professional but hilarious musical theatre productions. I've sifted through my old laptop today, with some 'memories' for you, as we had sudden rain storms this week that threatened my computer space AND sewing room space, so we unplugged EVERY thing just in case, because hey fellow seamstresses: WHO WANTS A SHORT CIRCUITED COMPUTER OR SEWING MACHINE, AMIRITE? 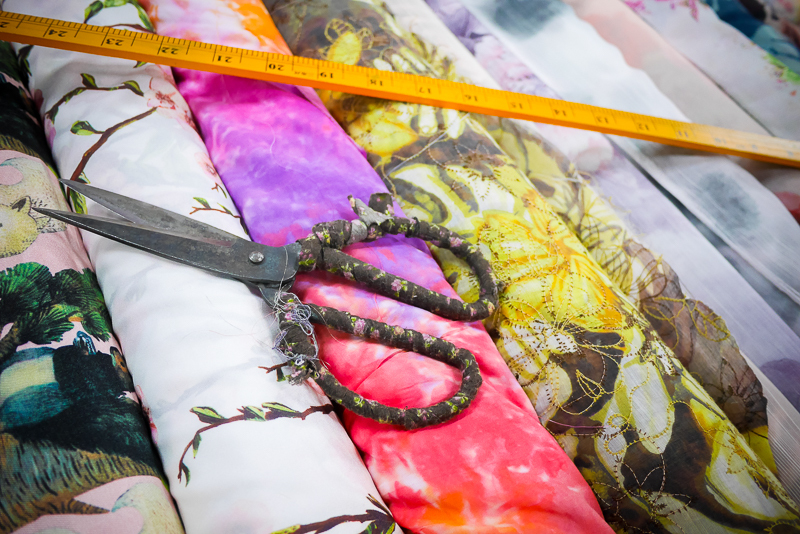 So I'm here on my old laptop, and may set up the sewing room as it's now a beautiful clear day... let's hope the rain stays away and OUT of my house! Oh the joys of home owning, we just got the gutter cleaned, and now we may need to get new gutters! Yay time to prioritise the budget AGAIN! But, here's a few photos on this old laptop that I thought would be a bit of memory lane for us! My old 'Crafty Adventures' banner from this blog circa 2008 or 2009? I ditched the 'crafty' when I just started posting about anything from my life. SUCH white hair. We stayed in a creepy hotel, but I have no idea/can't remember why. 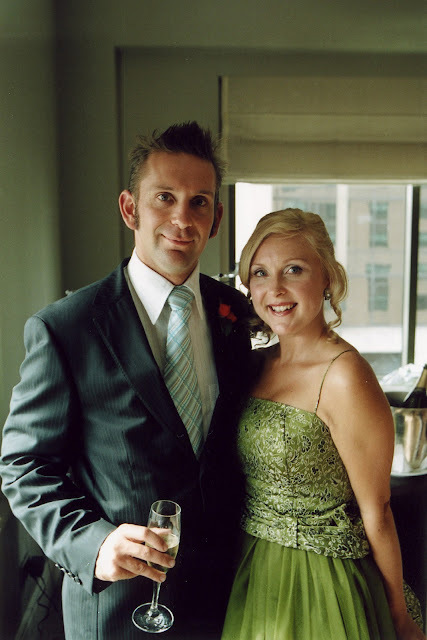 My brother and I before Husbie and I got married... my friend Claire emailed a whole bunch of photos and I must have saved them on this laptop... One day I'll get a photo album/book organised! Have any of you used Blurb before? I got a book last year printed up (I didn't show you because it was filled with photos of Doggie Darling, and I was too sad when it arrived) and I was really happy with the quality... and my friend Inner West Mum got a few books printed too, and they look AMAZING. Anyways, I was thinking of making a Blurb book of my wedding photos, once I get them all together in the one spot! 5 years of marriage people! 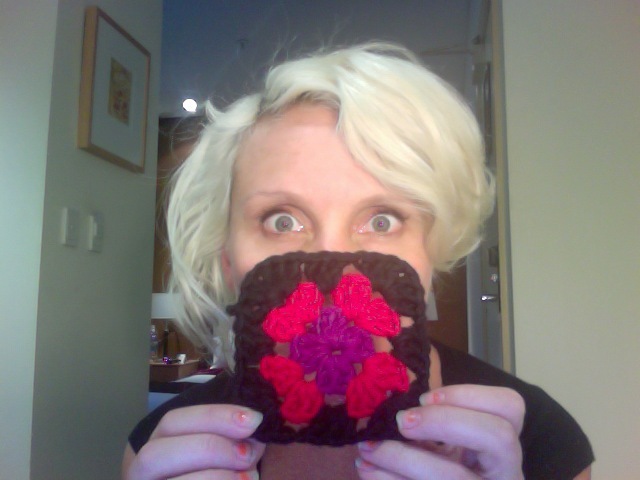 Anyways, here's the first granny square I ever crocheted too! I did end up making a blankie out of heaps more and gave it to a baby friend! SUCH orange hair. That didn't last long! It just didn't stay in my hair longer than 2 weeks, I think she used a tint and it looked great initially, but I had to use copper shampoo to maintain it, and it just warped in colour... so that's why I'm back to blonde, less white and more goldie BUT NOT TOO GOLDIE. I'm fine when my hair stays the same colour for at least 5 weeks (and then back for an update on the regrowth)... but I only wash it once a week, so extra special shampoos (I don't even use it) or conditioners are a pain in the arse ... just can't keep with the upkeep of it! I just got my hair dyed this morning. It is now red and I am so loving it! I like the photos of your hair white blonde. It looked very Marilyn Monroe! 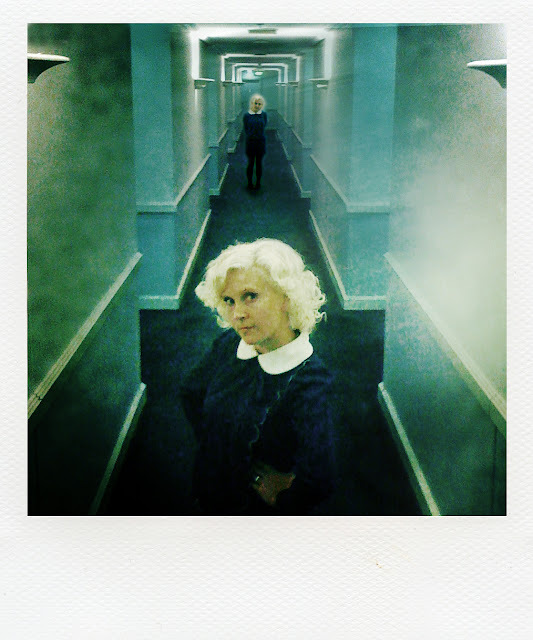 I just adore that photo in the hotel corridor. A bit vibe-y like out of the shining or the grudge or something... I LOVE it! Thanks Carolyn! Nah, I just forgot our wedding anniversary (not in real life, just to mention here) and my blog anniversary (and also forgot to mention it here!)... I'm having one of those "life gets in the way of documenting it" kinda periods! I kinda like the orange hair. Cute dress. Reminds me of one I made circa 1972.